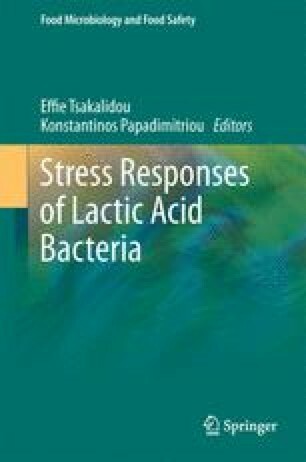 Lactic acid bacteria (LAB) are of great importance in the manufacture of food and dairy products, but also for an increasing number of biotechnological applications. When applied to industrial processes, these bacteria face various stress conditions, such as low pH, high temperature, osmotic shock, and metal stress. Of the last category, exposure to copper has received wide attention and detailed mechanistic insight is available. We thus have a comprehensive understanding of copper extrusion by adenosine triphosphatases, gene regulation by copper, and intracellular copper chaperoning. Structural work on copper homeostatic proteins has given insight into copper coordination and bonding and has started to give molecular insight into copper handling in biological systems in general. Also, recent biochemical work has shed new light on the mechanism of copper toxicity. The response of LAB to metals other than copper has received only little attention and will be discussed for other organisms to the extent that it could be relevant for LAB. Some of the work described in this chapter has been supported by Grant 3100A0_122551 from the Swiss National Foundation, a grant from the Swiss State Secretary for Education & Research, and a grant from the International Copper Association.